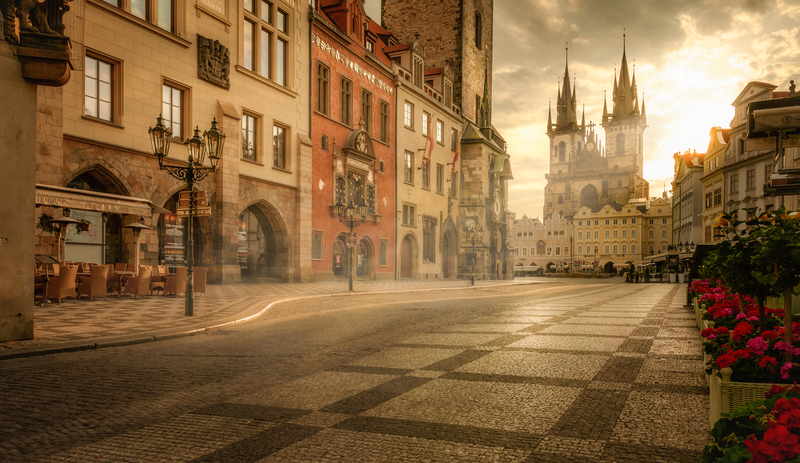 The Old Town Square is the oldest and most significant square in the historical centre of Prague. Its history dates back to the 10th century, when it served as a marketplace at the crossroads of European trade routes. The square was near the former customs house (Ungelt), where the goods imported by foreign merchants were always cleared. For them the Hospital with the Church of the Virgin Mary, inns and stables were founded in the 10th century. Regular and annual markets of various goods took place here. At the square there were both fixed and portable shops. Around the base of the town hall tower there were thirteen stone cots, where the most expensive imported cloth was sold. Even the Town Hall building itself was surrounded by shops of marketers. Portable stalls were occupied by bakers, potters, manufacturers of wood products, herbalists, ginger bread producers and other craftsmen selling their goods. On the south side there were vendors of mushrooms, strawberries and other forest products, and also game, vegetables, butter, cheese cakes, grease, wreaths, skirts and other goods were sold there. In the north-western part of the square near the Town Hall there was a fish market. Vendors of fish were the most numerous as the Old Town market had a privilege for fish for the long time. Over the centuries the square had different names: its oldest known name was the Great Square (as opposed to a smaller marketplace at St. Gall - sv. Havel); in the 13th century the name Old Marketplace appears, from 14th century it was called Market Square or Old Town Market Square, in the 18th century it was called the Old Town Place, Big Old Town Square or just the Big Square. The current name has been applied since 1895 and has been used till present. In the 12th and 13 century many houses were built around the square and their Romanesque and early Gothic foundations, cellars and sometimes even parts of the ground floors have been preserved till these days. The original Romanesque ground floors and exceptionally also parts of the first floors got underground approximately in the middle of the 13th century as a part of anti-flood measures, when the terrain was filled with the soil up to the significant height. In the 14th century the Town Hall was established at the square and the main Old Town church called the church of the Virgin Mary in front of Týn was built a bit later. 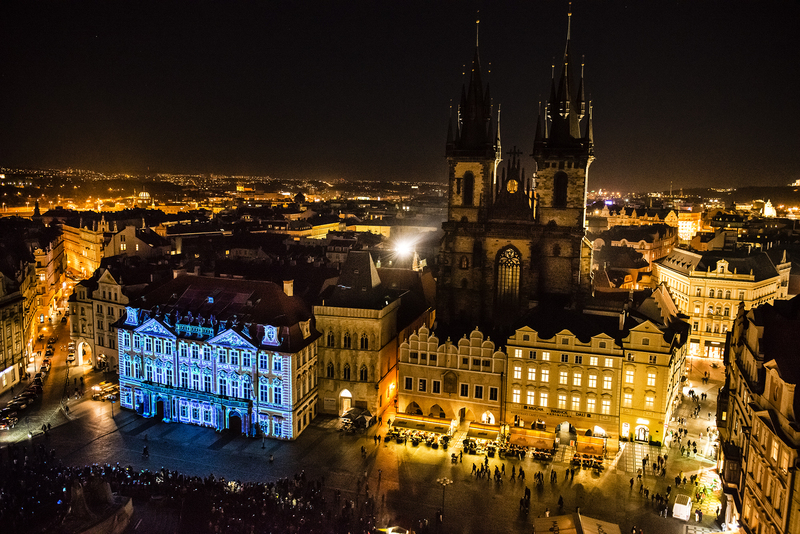 These projects highlighted the importance of space that had become not only the economic but also the political centre of the life of the Prague Old Town. Royal coronation processions travelled through the square on their way to the Castle and were much celebrated. John of Luxemburg was the first Czech king, who passed through the square in 1311 together with his wife Elisabeth of Bohemia. The square was also a scene of tragic events such as executions, but also various festivals and gatherings of the people. In 1422 the square witnessed riots after the execution of Jan Želivský, the leader of the Prague poor, who was beheaded at the well at the town hall courtyard. In 1437, the execution of the last Hussite captain Jan Roháč z Dubé a ze Sionu and his fellows took place here. After the defeat of the Hussite Revolution, Jiří z Poděbrad was elected the King of Bohemia here in 1458. One of the most tragic events took place in front of the Town Hall on 21 June 1621, when 27 prominent participants of the Czech revolt against the Habsburgs were executed here. Following gentlemen were decapitated: Jáchym Ondřej Šlik, Václav Budovec z Budova, Kryštof Harant z Polžic a Bezdružic, Kašpar Kaplíř ze Sulevic, Prokop Dvořecký z Olbramovic, Fridrich z Bílé, Otta z Losu, Diviš Černín z Chudenic, Vilím z Konecchlumu, Boleslav starší z Michalovic, Valentin Kochan z Prachové, Dobiáš Štefek z Koloděj, Jan Jesenius, Kryštof Kobr, Jan Šultys, Maximilián Hošťálek, Jiří Haunšild, Leandr Ryppel, Václav Maštěřovský, Jindřich Kozel, Ondřej Kocour, Jiří Řečický, Michal Wittman and Šimon Kováč. Jan Kutnauer, Šimon Sušický and Nathanael Vodňanský were hanged. Jan Sixt z Ottersdorfu, who was also to be beheaded, was amnestied at the loose. In commemoration of them 27 crosses are marked in the sidewalk along the Old Town Hall, as symbols of swords and thorn crown. For the first time the place of the execution was marked in the pavement in 1904 on the occasion of the replacement of paving around the square. From 1591, the famous Krocín´s Public Fountain stood in the northern part of the square (see document Fountains). In 1650 Marian column by Jan Jiří Bendl was erected here as a symbol of thanks for the liberation of Prague from the Swedes in honour of the Immaculate Virgin Mary. This was the second oldest pillar in Europe after Munich and it stood there until 1918, when it was torn down (see document Monuments, statues). Currently, there is a brass table at its place, which resembles it. Also the Prague meridian is marked in the pavement indicating the place where the Marian column cast the shadow at noon of sunny days. It is 14 degrees and 25 minutes east of Greenwich. Czech and Latin inscription on it reads: Meridian, according to which the time was conducted in Prague in the past. Meridianus quo olim tempus Pragense dirigebatur. From 1849 so called Hauptwache, a major military guardhouse with two cannons at the entrance, stood at the square under the town hall balcony facing the Týn Church. The crew guarded government-issue and town coffers. In the first half of the 19th century the appearance of the square was changed by the construction of a new town hall in the neo-Gothic style, so-called Sprenger wing. Also the redevelopment of the area in 1890s had a big impact on the square when the demolition of houses occurred in the northern part of the square and the entirely new Mikulášská Street with a view of Letná was created, which has been since 1926 known as Pařížská Street. Before the redevelopment the area was built-up with houses. In addition, in front of the church of St. Nicholas the Krenn (Křenův or Chřenovský) House stood from the Middle Ages and which obscured the view of the church. It was demolished in 1901 during the redevelopment. The Jan Hus memorial by Ladislav Šaloun was unveiled at the square in 1915 on the occasion of the 500th anniversary of burning Jan Hus in Constance (see document Monuments and statues). In 1902, the rally was held here for the universal adult suffrage and on 14 October 1918 people requested the establishment of a free Socialist Republic. In February 1948 the then Prime Minister Klement Gottwald in his speech from the balcony of the Golz-Kinsky Palace announced to the assembled people the uncompromising program of building socialism in Czechoslovakia, and so a long period of totalitarianism in this country began. Locals still come together in the square at major events. In recent years, the tradition of Christmas and Easter markets has been renewed here. Since April 2007 restoration works have been carried out and the statue is covered. The completion of the works is expected for the beginning of the tourist season in 2009. Tram rails that led here from Pařížská and Celetná Streets disappeared in 1960 and buses were then eliminated in 1967. In 1979 also the public car park was abolished at the square. The decision was made that the whole square as well as adjacent Celetná Street became a pedestrian zone and all transportation was excluded from it. The vehicular traffic only was retained between Pařížská and Dlouhá Streets. Today just a horse-drawn carriages for tourists park at the square along the tree alley behind the town hall. In 1987 the reconstruction of the square was completed. The piety place of execution 27 leaders of the Czech anti-Habsburg resistance in 1621 was restored. The whole square was re-paved and 23,000 square meters of the new paving were laid in total. The underground services in the whole area were completely regenerated in the collector of household connections under the square. The square was lit up with 29 new lamps with two hundred lights. A park was established at the place of the original northern wing of the town hall, which was destroyed during fights in the spring of 1945. In 1998, the resting place of nearly 2,000 m2 was changed by planting 51 maple trees, installing benches and new tiles in blue, red and white colours. The square area is just over 9,000 m2. Due to its importance the Old Town Square was declared a national cultural monument in 1962. - Old Town Hall (No. 1) see separate document. From the Old Town Hall let's move on to the opposite building. - At the Golden Angel House (No. 29), sometimes also called At the Black Angel is a baroque house built at St. Michael church, with which it was once connected. In the early 15th century there used to be a chapel here with a Gothic reticulated vault. In the upper part of the chapel a wall painting from the early 15th century depicting St. Prokop, St. Adalbert and St. Vitus was discovered; it was taken down, restored by František Sequens and stored in the Prague City Museum. In 1594 already bigger house was described at the place, which was featured as At the Angel House from 1684 and At the Black Angel in 1726. In the first half of the 18th century it was radically rebuilt in the Baroque style. The two-storey house got the third attic floor in 1887. On the left side of the house the lane led to the St. Michael church. After the church abolition under Joseph II the lane was built up. The house has a bay window above the portal entrance; in its axis there is a cartouche with a painting of an angel. The sandstone statue of St. Florian on the corner of the house was created by Ignác František Platzer after 1760. The house is known for its U Prince restaurant. - Vilímek´s House (No. 28), recorded in 1462 as a U Kryštofa (Christopher) house is the rear wing of the former Servite convent At St. Michael. In 1472 - 1514 an extensive Gothic reconstruction and later Renaissance reconstruction took place, and in the first half of the 18th century the house was rebuilt in the Baroque style. It is a palace-type building with a late Baroque facade, designed probably by František Ignác Prée. On the ground floor there is the late Renaissance portal from the first half of the 17th century. - The neighbouring At the Ox House (No. 27) is located on the corner of Old Town Square and Melantrichova Street. It is the early medieval building, which has been rebuilt in the Gothic and late Gothic style by 1540. It got the name At the Ox in the 15th century by its owner Ochse, but it was also called U Smertošů and At the White Lion. The Renaissance adaptation was made after 1609 by the new owner Martin Smertoš jr. Around the year 1740 a significant baroque reconstruction took place. From that time the Baroque gable has been preserved on the facade. Originally also the Gothic portal from the 15th century was preserved but in the years 1935 to 1936 it was rebuilt to the shopping window following the house adaptation by the architect Karel Roštík for the former owner, Mr. Kyncl, who was the cloth trader. On the corner of the building in the niche on the first floor there is the sandstone copy of the St. Joseph statue by Lazar Widmann from the time after 1750. The original has not been preserved. The house is connected to and supported by two arches across Melantrichova Street with the opposite Štěpánovský House. - Štěpánovský corner house (No. 26) was named after its owner Štěpán z Kladska from the early 15th century. Previously it was called Na Kamenci. Originally a Romanesque house dating back to 1170 - 1200 was rebuilt in the early Gothic in the 3rd quarter of the 14th century and further extended around 1550 and later in the Renaissance period. Today's facade is early baroque from the 17th century with Renaissance gables. In the Gothic archway of the house from the 14th century there is a portal from the early 16th century. The house stands on a deep plot that stretches all the way to Kožná Street. - The Blue Goose House (No. 25) has always been the seat of an old inn; already in the 16th century there were large wine stores here. For the long time it was also known as U Bindrů house by Bindrova wine pub, previously it had been named U Človíčků and U Modré hvězdy (Blue Star). At the place of the Romanesque house from the 12th century, the remains of which have been preserved in the basement, the gothic two-story house was built in the second half of the 14th century. The entrance hall, rear chamber and passage into the yard come from that period. A major reconstruction took place in the early Renaissance period from 1546 to 1571, when the arcade was also created. In the mid 17th century the house was owned by Daniel Voříkovský z Kunratic, who was elected Prague mayor in 1699 and probably adapted the façade in a representative style. Today's facade is an adapted late-Baroque style. After 1926 the house was communicatively connected with the Štěpánovský house. - The At the Red Fox House (No. 24) was originally Romanesque and was rebuilt in the Gothic style several times. In the late 17th century the house was adapted in an early Baroque style that reminds of buildings by Jean Baptiste Mathey in many aspects. Today's façade and layout of the house come from that time. Inside the houses there are interesting stucco and painted interiors. The original house sign is already missing from the house and was replaced by the gilded relief of the Virgin Mary. - The At the Storks House (No. 23) has had this name since the 14th century, when storks were painted on it. The building is Gothic and was extended in the Renaissance style in the late 16th century. A significant early Baroque reconstruction took place before 1689. The layout of today's façade with a two-storey gable comes from that time. Like the neighbouring houses it has the arcade and has been built on a narrow and deep plot that stretches all the way to Kožná Street. House interiors were damaged in 1945 during fights with the Nazis. During the subsequent repairs, the house was operationally connected to the adjacent house No. 22, which was also damaged by the Nazis. - House (No. 22) was built in the 18th century combining two separate medieval houses At the Golden Crown and At the Golden Horse. The right House now with the arcade was owned by Ottavio Strada z Rossbergu, the well known antiquarian, till 1605, who had installed the house sign of the Golden Crown. Before 1690 both houses were adapted in the early Baroque style. In 1767 they were acquired by one owner and in 1770, were put together, adapted in the late Baroque style and on the right side of the house the arcade was modified. The reconstruction after a fire in 1945 took place in 1949 – 52. House signs are missing today. - At the Golden Camel House (No. 21) is the last and thus the corner house of the block, the facade of which faces back to Železná Street. Even this house was built on a plot of two original buildings, out of which the corner house was demolished during the radical reconstruction in 1858, thus allowing expansion of the mouth of Železná Street. The house was rebuilt in the romantic style according to the projects by Jan Bělský. Under parts of the house a large Gothic cellar has been preserved. From the first half of the 19th century for over 100 years a well-known watch shop was located here whose owners, Hainz family, used to be the administrators of the Astronomical Clock. - The At the Unicorn House no. 20, also called at the Golden Unicorn or The White Horse, see separate document. - The Lazarus House (No. 19) is a Gothic building with a Romanesque nucleus from the late 12th century. In the last quarter of the 17th century, after having been acquired by the Carthusian prior in Valdice, the house was reconstructed, which gave the basis to today's appearance. In 1803 neoclassical facade balcony was installed to the two-storey facade. The picture of the Virgin Mary with baby Jesus in a gold frame is on the house. - The At the Stone Table House No. 18 is also called At the Currency. In the 14th century the old house went through the Gothic adaptation, which gave the house approximately the current size. Before 1472 the house was purchased by Jiří z Poděbrad, who briefly established a currency exchange office there that is why the At the Currency name. After 1724 the building was rebuilt in the High Baroque style, it was raised by two floors, partly vaulted and got a new high quality façade. In the middle of the first floor there is the stucco frame painting of St. John Almužník. After the year 1907 the literary salon of Berta Fantová was in the house, which was also visited by Franz Kafka. - The At the Stone Lamb House (No. 17) has preserved Romanesque walls and Gothic cellars in the basement. In the 14th century a newly built Gothic building was built at the place of older building, which was rebuilt again around 1530 in the early Renaissance style. At that time the important entry portal was built, probably the work of court artisans of Benedikt Ried. In the early 17th century the house was raised by one the floor and above a high late Renaissance fanged gable was built. From 1725 the house was owned for some time by the architect František Maximilián Kaňka. From the last quarter of the 18th century to 1945 the pharmacy at the White Unicorn was located in the house, which was named after the house sign from around 1530. On the stone plate on the house there is a lamb with one horn and the figure of a man. A memorial plaque at the entrance points out that in the years 1910 to 1911 Albert Einstein lectured here. The house was the seat of Berta Fantová social salon, where German-speaking writers and celebrities such as Franz Kafka, Max Brod, Franz Werfel and Egon Kisch Ervin used to meet. The house burned down during fighting in May 1945 and its interiors were newly constructed. - At the White Unicorn (Trčkovský) House (No. 15) with arches already stands on the corner of Celetná street. It was built on the foundations of two Romanesque buildings that were expensively rebuilt in the 14th century. The arcade is from the period after 1330. An important Renaissance reconstruction was performed by owners, Trček family, according to whom the House also called Trčkovský. In 1703 the pharmacy at the White Unicorn was established here and was transferred under the same name to the house No. 17 in the end of the 18th century. In 1754 Josefina Hambacherová, married Dušková, the well-known singer, wife of composer Frantisek Xaver Dušek and friend of Wolfgang Amadeus Mozart was born in the house. In 1770 the house was equipped with baroque facade. In the second half of the 19th century the owner Mr. Šmolka arranged the late Greek revival rebuilding according to the project by Jan Bělský and it was then, when the beautiful late-Renaissance gables were taken down and replaced with another floor. The gables were recently reinstated by the original appearance. - Golden Cross House (No. 10) at the site of an old house demolished for redevelopment built by the builder, V. Romováček, in 1906. He granted the project for the façade to the proven artist, architect Richard Klenk z Vlastimilu according to the wishes of the Municipal Authority; he assumed the work in a mannerist style: Above the main cornice there is a gable with a triangular tympanum including the relief of the gilded the sun with a cross in the middle; at the sides of the tympanum there are vases and the metallic wind rose on the top. The windows are decorated with rich stucco with vines and other floral motifs. On the first floor among flagpoles there is a sign of Prague. In 1939 the house was adapted for the Funeral Institute of the City of Prague. - Elephant House (No. 9) also called The Golden Elephant or Cukrovský. Since the Middle Ages there had been an inn here. In the mid 17th century an early Baroque rebuilding was made and later in the mid-18th century the owner, count Cukr from Tamfeld made another - rococo reconstruction. At that time, Cukrovský sign that gave the house name appeared above the portal. Despite the protests of the Club for Old Prague the house was also destroyed during the sanitation from 1904 to 1905. From 1905 to 1906 new house designed by František Schlaffer was built at the place with a neo-Baroque façade with rich stucco on the 1st floor and painted scenes on the front towards the Dlouhá Street. On the corner of the house with archway there is a corner bay supported by the figure of Atlas. - The former Pauline monastery (No. 7) is located on the north side of the square diagonally opposite the House of the Elephant. It is the only house on this side of the square, which remained from the original buildings. It was built by Pauline order, after they received a neighbouring St. Salvator church as a gift in 1626 (see separate document), which had been confiscated from German Lutherans after the Battle of White Mountain. Paulians later adapted the adjacent house to the provisional monastery. Later, they bought another house and united them in the years 1688 to 1696 structurally. They built here a large convent building here with a new facade to the main square according to the project by Pavel Ignác Bayer with the participation of the architect Giovanni Domenico Canevalle. The new facade of the convent building was equipped with statues by Matěj Václav Jäckl from 1696, which still adorn the house. It's St. Caspar de Bono, Archangel Raphael, Angel Guardian and Grazia Blessed from Valencia. In the middle niche there is a statue of the founder of the order St. František from Paula and St. Salvatore at the top of the gable. In 1784 Josef II abolished the monastery and the religious left. Consequently, there was a guard room of the riding guard there and later the building was assigned to the coinage office, the operation of which here lasted until 1857. When the City of Prague bought the monastery they demolished the adjacent courtyard buildings. In the 14th century Jošta Palace was here, in which also the second wife of Václav IV., Žofie, lived. In the basement two Romanesque premises have been preserved. - House No. 5 on the corner of Pařížská Street replaced the two original valuable buildings, which fell prey to the Old Town redevelopment as the first in 1895. At their place the neo-Baroque apartment building with restaurants and shops was built in 1896-97 according to the project of Otakar Materna and the professor of the Czech Technical University, Rudolf Kříženecký. According to the wishes of the city the baroque ornamental details from the original house and the Pauline monastery were used on the house. In May 1945 the house was damaged during the battle for the Old Town Hall and reconstructed after the war by architects Jaroslav Stránský and Karel Storch. On the chamfered corner of the house there is a bay on the 2nd and 3 floor bay supported by Atlants, larger than life by Vilém Amort. On the facade to Pařížská street there is a Bacchus statue in niche by Jindřích Říha. The entrance to the house from the square is surrounded by Ionic columns with allegorical sculptures by Vilém Amort, which represent the battle between the old and the new construction methods. On the 2nd floor above the entrance there is a relief of angels with medallion probably by Jindřich Říha.